Before people go crazy after their no spend January, I wanted to give a heads up on what to expect in the stores this coming season. Although I love Autumn/Winter and love all the chunky jumpers, coats and boots, I am so over it and looking forward to next season. In January I get into a style rut, dressing too much for comfort and basically wearing a jumper and jeans most days. The weather doesn't help but looking forward to warmer weather and really excited about the new season trends this Spring. The catwalk was full of colour and details from feathers, fringing, ruffles and more. As always I've picked out four of my favourite trends this season. These are trends that will last in your wardrobe and not just a one-off trend. First, COLOUR, probably my favourite trend! I need to embrace this trend more and would love to find a colourful dress for summer. 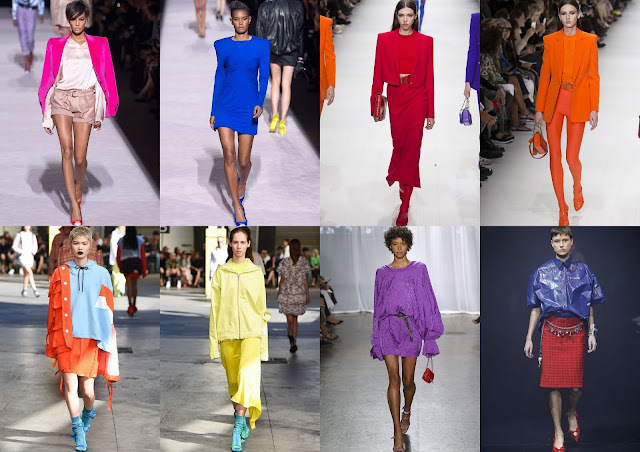 Bright colours were seen on most runway shows like Marni, MSGM, Versace and many more. 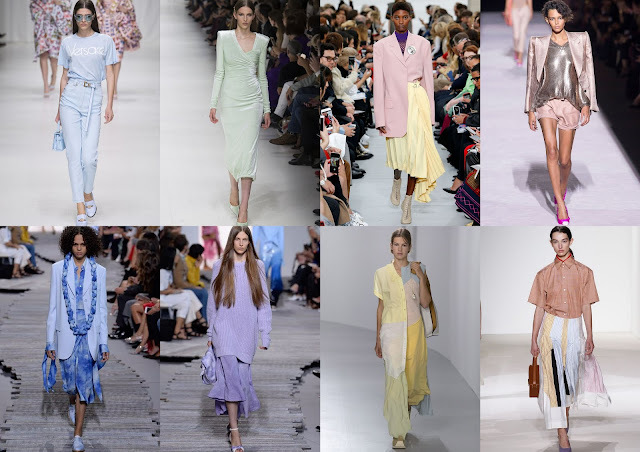 Secondly, PASTEL COLOURS, nothing new for Spring but the lilac seems to have replaced the pink this year, as seen on the Michael Kors and Victoria Beckham shows. Thirdly, PENCIL SKIRTS. 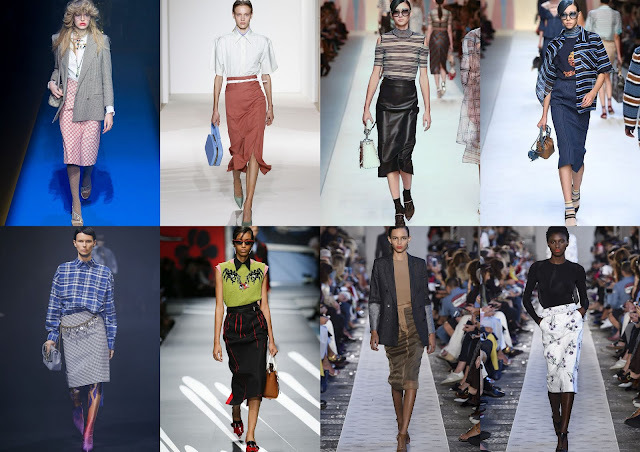 I'm looking forward to this trend, I've seen too many short skirts in the past that I wished were a little longer, I also have a few which I'm looking forward to wearing from seasons back. I think this will be the new midi replacing the pleated skirt, not that the pleated skirt is going anywhere! 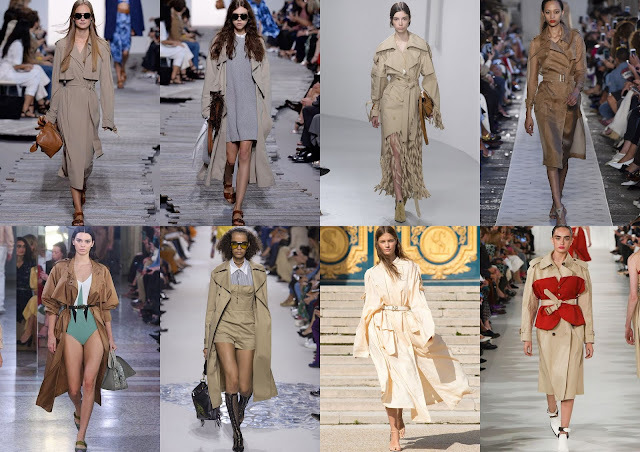 Fourth trend, TRENCHES, a classic timeless piece that you can take out year after year, great for the transition period. Remember to have a clear out of your wardrobe as you may have some of these trends already. Update your wardrobe with some items that will fit well into your other clothes and style. I'm actually surprised how fast January has flown by, happy shopping as always!